Happy July, fellow food lovers! Summertime is in full-swing, and we have lots of reasons to celebrate food during this warm summer month. This is the month when many blueberry bushes reach their peak blue and when a nicely chilled salad hits the spot on a hot day. It’s the season when you could practically fry corn fritters on the cement in the sizzling hot sun and when the balmy air spreads the velvety smell of ripening raspberries through your backyard. These are just a few of the foods we’re going to talk about in today’s post, a continuation of our series on monthly food holidays. Ahh, you just can’t beat some freshly picked blewbs, can you? (By the way, that’s slang for “blueberry.” I picked it up from a friend a couple years ago.) I can almost smell the ripening bushes and feel the soft skin of the berries on the tips of my fingers. Probably the best berries for a relaxing picking outing, blueberries originated in North America. Lucky us. As a North American native, this plant is quite accustomed to the cooler northern climates and grows best in the States. Michigan is the top producer of the cultivated strain of the blue fruit. 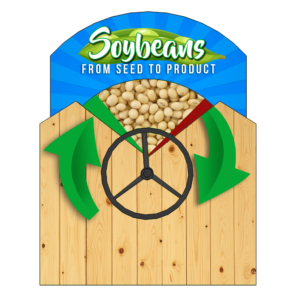 According to the Agricultural Marketing Resource center, the state recently produced over 100 million pounds of the little blue bombs. That was worth about $130 million dollars. 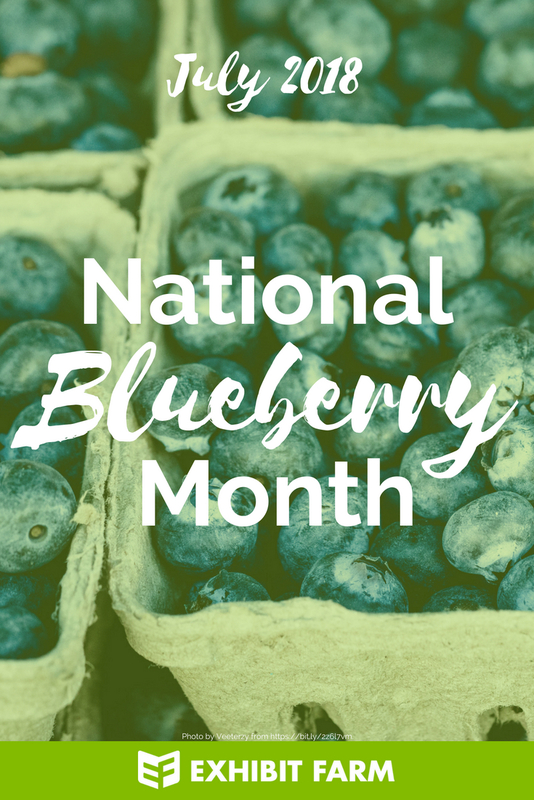 Washington, Oregon, and Georgia have distinguished themselves in blueberry production as well. When it comes to wild blueberries, Maine takes the lead. These deceptively delicious fruits aren’t just good for your tastebuds. They’re good for your health too. In fact, thanks to all of the fiber, antioxidants, and essential nutrients packed into these tiny blue fellows, the world of nutrition considers blueberries to be superfoods. (Ya know, like superheroes, except they’re superFOODS.) So next time you get a chance to munch on some of these delightful blewbs, do it. Your whole body will thank you. Plus it’s July, which means it’s the right time to celebrate our fruity friend. It’s almost July 4th! And you know what that means, right? Okay sure, it’s the day that the Continental Congress adopted the Declaration of Independence back in 1776 and the holiday when Americans across the country celebrate with fireworks. But it’s also the anniversary of the invention of Caesar Salad. That’s right: it’s not just Independence Day. It’s National Caesar Salad Day. Despite the popular misconception, Caesar Salad is not named after Julius Caesar or Caesar Augustus or any ancient Roman emperor. It’s actually named after the guy that first conjured up the popular salad dish. His name was Caesar Cardini, a restaurant owner who lived in Tijuana, Mexico. They say that he came up with his namesake salad in 1924 during Fourth of July weekend by just throwing together some of the ingredients he had in his restaurant. The original recipe included a combination of romaine lettuce, garlic, croutons, Parmesan cheese, boiled eggs, olive oil, and Worcestershire sauce. 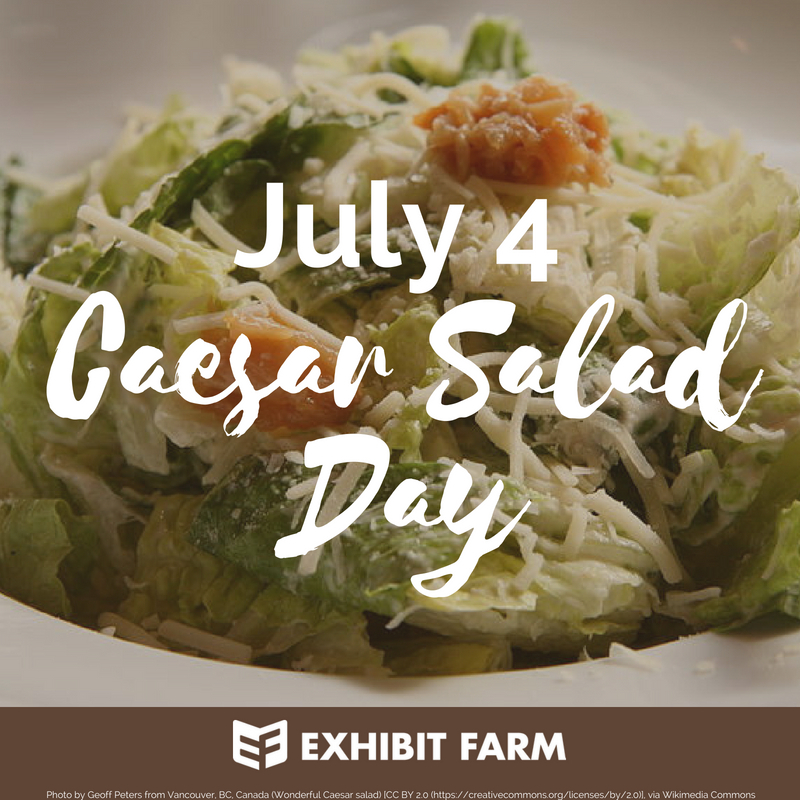 According to the website kitchenproject.com, Caesar Salad became so popular that it almost singlehandedly created the entire romaine lettuce industry in the United States. Before the Caesar salad, romaine lettuce was a bit foreign to American eaters. About 95% of all lettuce grown in the States was iceburg lettuce, and they were okay with that. Then came the invention of the Caesar salad in 1920, and things changed. I guess you could say they weren’t okay with it anymore. By 1970, the fast food industry discovered the salad and made it a bit of a staple in the States. That’s when growing romaine became a necessity to the United States. As the Los Angeles Times reports, “From almost nothing, by the mid ’90s, more than 16,000 acres of romaine was being grown. By 2000 that had increased to more than 60,000 acres and today it stands at more than 80,000.” Just remember that story next time you try to concoct a new salad recipe. 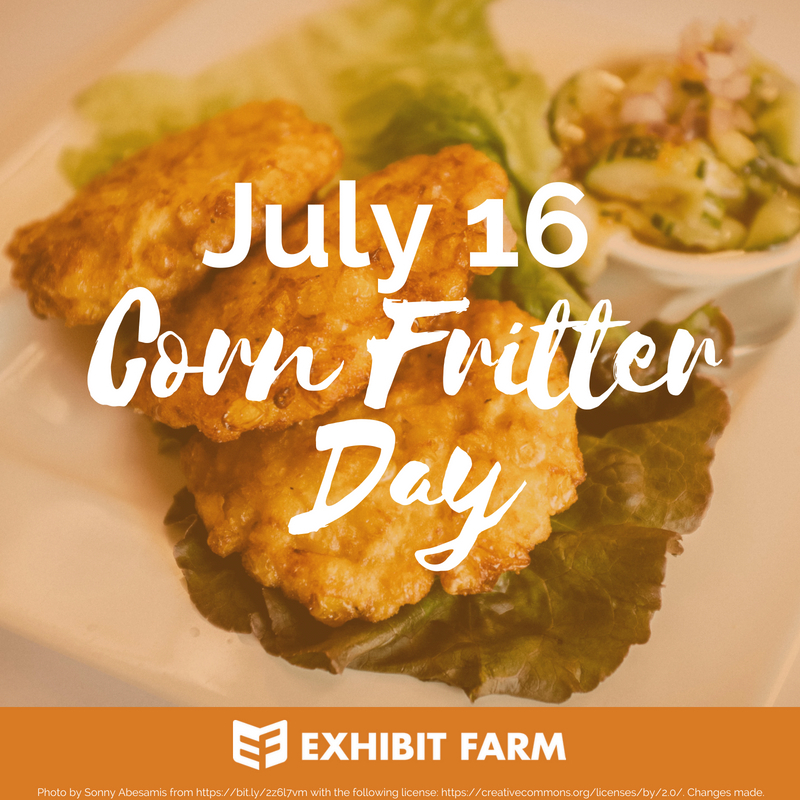 According to the page on national corn fritters day on punchbowl.com, “Corn fritters are savory bites of fried or baked corn batter–a mixture made with corn, egg, flour, milk, and melted butter.” In the United States, this fritter dish originated in the southern part of the country. Plenty of other countries, however, have similar sorts of pancake-like “fritter” dishes that they eat as well. So who’s to say which country thought of the fritter first? But, since corn is indigenous to the Americas, perhaps it’s likely that the continent can claim the honor of coming up with the “corn fritter” first. Let me remind you, though: corn fritters are not to be mistaken for Johnny Cakes. Let’s not even go there, though. Ahh! And now for dessert. 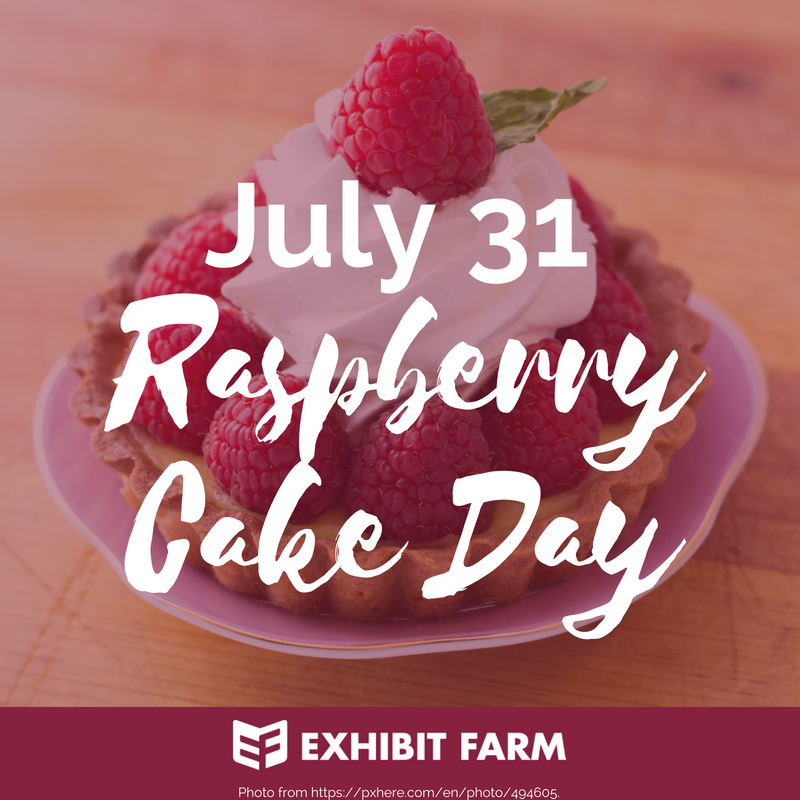 The last day in July is National Raspberry Cake Day, a national food holiday sponsored by the delicate (usually) red fruit, the raspberry. This delightful summertime growth of those prickly plants just so happens to be a part of the rose family of plants. Apparently, it’s a family that likes to combine delicacy and beauty with a stinging thorniness. Ya know what, though, some families of people are just like that too. Raspberries are an ancient fruit thought to have originated in eastern Asia. Regardless of where they first came from, they soon made their way across Europe. Ancient Greek and Roman authors even mention raspberries in their writings, according to world-foodhistory.com. Looking at these accounts, the first recorded raspberry harvest took place in AD 45. When the fruit finally made its way to America, it was the late 1700s. Today, the United States is third largest raspberry producer in the world, following after Russia and Poland. Most U.S. raspberries grow in California, Oregon, and Washington, and they come in come in a couple different varieties. Namely, the black raspberry variety and the red raspberry variety. California leads the United States in production of both kinds, but there are other varieties of raspberries as well. This includes purple and yellow raspberries. We just don’t see these as often. 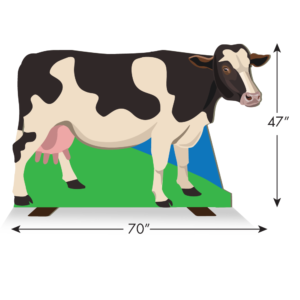 For the rest of July’s food holidays, check out this comprehensive list at Foodimentary.com. Hope your July is full of berries and salads! Try not to fritter it away.